Kiwi is a temperate fruit and it can do well in the temperate regions of Kenya like Central, Western highlands, Central Rift Valley and others. There are very few markets where demand exceeds supply. One such market is for Kiwi fruits which, despite being a relatively new idea in Kenya, has taken the market by storm. There are very few farmers who have gotten wind of its valued benefits and you can take advantage of this loophole to make a timely investment. Here is a step-by-step guide on how to go about it. The kiwi trees cultivated for their fruits need the following growing requirements. kiwi fruit farming guide. Must be well drained. Kiwi tree vines planted where water sits on the surface following rains are likely to develop crown rot. Soil pH should be between 5.0 and 6.5. Related; Kiwi fruits benefits and facts. The kiwi tree is especially touchy about less than perfect site and soil conditions in its youth. For this reason, some growers coddle their plants in containers for one, even two, years. Kiwi tree growth can be phenomenal in carefully watered and fertilized containers, and the kiwi tree can be protected their first couple of winters in an unheated basement or a slightly heated garage. In Kenya Kiwi should be Planted at around the month of March to take advantage of long-rains. Note that Kiwi Vines are very vulnerable to strong wings and you may need to invest a bit more infrastructure-wise to protect them (e.g. by building a temporary fence or planting some trees around the farm). Also, a farmer needs to invest in a compost manure and some little amounts of fertilizer (D.A.P and C.A.N) to provide the crop with adequate nutrients. Kiwi plants are susceptible to a bacterial infection known as Psa and so the farmer may need to invest in biochemicals that are usually used on fruits like oranges and grapes. The burden of pollination rests mostly with honeybees, though wind and other beneficial insects also play a role. With few exceptions, a separate, non fruiting male plant is needed to fertilize (and induce fruiting) of female plants. The male should be no further than 35 feet from females. Do not be surprised if it appears that female flowers have stamens, the male flower parts. The stamens are there, but the pollen they shed is sterile. Similarly, male flowers have small, nonfunctional ovaries. One male plant can fertilize the flowers of 8 or so females, and male and female plants need not be the same species of kiwi tree to cross-pollinate. Bloom times of male and female flowers must coincide, though. Hand pollination is practical if you grow only a few kiwi trees. Merely pluck off a male blossom and lightly rub it on a half-dozen female flowers. Then go pluck another male, repeat the rubbing, and so forth. Kiwi trees are rampant plants and their trunks never become sturdy enough to hold the plants up off the ground of their own accord. Under cultivation plants must be trained to some sort of support that is both sturdy and allows vines adequate room to ramble. The goals in training and pruning are to make a potentially tangled mass of rampant shoots manageable and easy to harvest, and to keep a vine fruitful by allowing adequate light to fall within the plant canopy. Pruning also stimulates an annual flush of new wood, important because flowers, and, hence, fruits, are borne toward the bases of current seasons’ shoots that grow from canes that grew the previous year only. Not all the new shoots that grow from the previous year’s canes will fruit. Some canes may have been too shaded the year before, or the vine may be too young. Those canes that are fruitful will produce fruiting shoots at their basal half-dozen or so buds; the buds further out are capable of producing shoots that will fruit the next year. An established kiwi tree vine consists of a trunk, permanent cordons, and fruiting arms (or canes). Training and pruning are effected by tying shoots to supports and by pruning the plants while they are growing during the summer, and again while they are dormant. Late winter, before the buds swell, is the optimal time for dormant pruning. Girdling is a technique that induces fruiting and hastens maturity and bud-break by disrupting the flow of nutrients and hormones in the stems. In late summer, make two parallel cuts, one sixteenth of an inch apart, on the trunk, and remove the strip of bark from between the cuts. Do not girdle any vine that is in a weakened condition, or cut too deeply—remove just the outer bark. A mature kiwifruit vine can produce more than 90 kilograms of fruit. Harvest semi-tropical kiwifruits by snapping them off their stalks when the skins turn brown and samples of cut fruit show black seeds. The fruit will be hard, but will soften and sweeten in a week at room temperature. In a cool room, such fruit will keep for two months. If the fruit is refrigerated to near freezing, and the humidity maintained at 95 percent (with a plastic bag having just a few small holes, for example), the fruit will store for 9 months! Let firm-ripe fruit soften before eating. This can be hastened by putting the fruit in a bag with an apple. 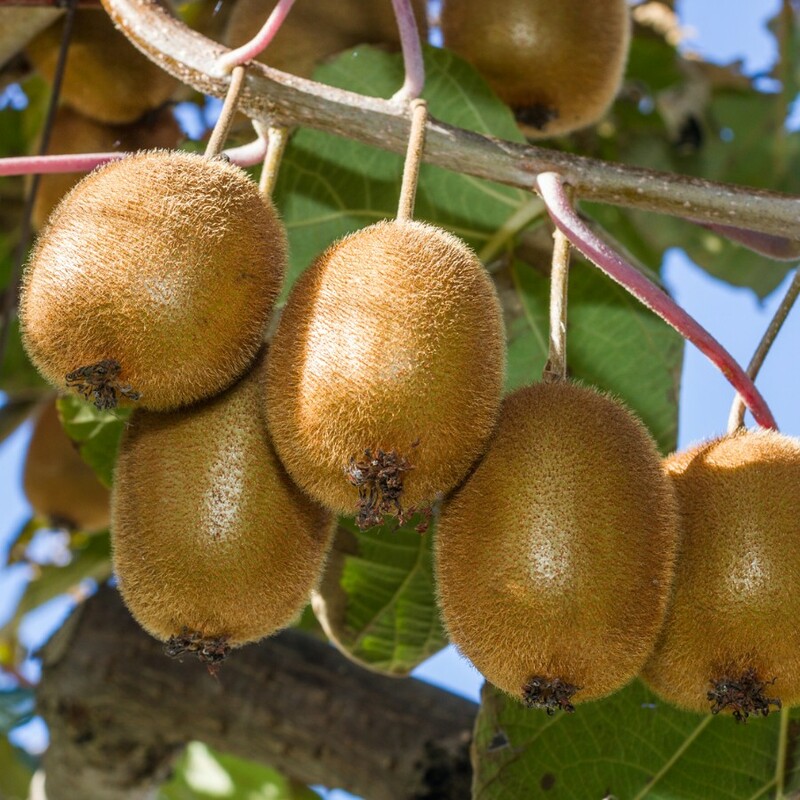 Hardy and super-hardy kiwifruits drop or come off easily from the vines when they are ripe. Picked firm-ripe with their stems attached, these small fruited kiwifruits store as well as the large kiwifruit. The average kiwi vine takes 2 to 4 years to mature and start producing fruits. The first few harvests may however not be as productive but this tends to improve throughout the plants mature life. You can still commercialize your farm now by selling the few fruits that come out of it and healthy vines that you may choose to propagate. At Oxfarm, we sell kiwi seedlings at Ksh 400, and we deliver all over Kenya. First i want to thank you for the good work you are doing.i urgently need Kiwi seedlings.i am within Nairobi CBD.When can i collect and at how much.thanks.